Remember those “Best Friend” necklaces you would win at bowling alley birthday parties and split with your best friend du jour? They just got majorly upgraded. Henry and I have a set of these, and they are a-dor-able. If you prefer a more subtle look, Friendship Collar offers a new take on friendship bracelets with many styles of coordinating dog collars and cuff bracelets. These are so darn cute and there is an option to match any outfit! On the other hand, if you’re feeling crafty, we have a tutorial for a fully-custom set. Proclaim your love to the world in a bandana and infinity scarf combo! This set features a stylish woven buffalo plaid pattern and a screen-printed gold heart. If this color scheme isn’t your jam, Willowear offers several additional styles in their Etsy shop. We have a couple of bandanas from Willowear, and their quality is top notch! Brave the winter cold together in these style handmade cowls from Irina’s STRICKMODE on Etsy! They’re gorgeously knit to keep you and your small pup both cozy and stylish in the February chill. This is another take on the “Best Friends” Necklace, but with a personal twist! This set is absolutely classy, will match any outfit (or collar! ), and will keep your best friend close to your heart. Can you resist this adorable set? All You Need Is Pug offers additional matching sets, as well — including a set of knit aviator hats. TOO CUTE! 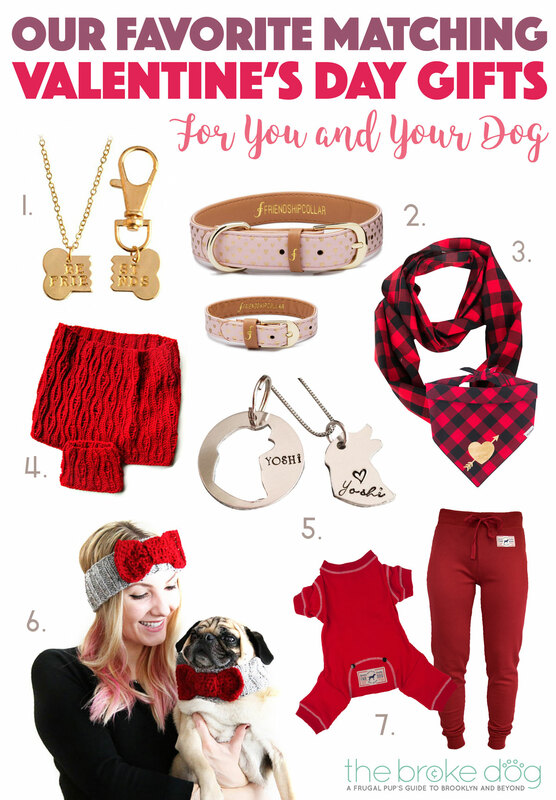 Which set do you want to rock with your dog this Valentine’s Day? Let us know in the comments! They are all adorable, it’s hard to pick one favorite! I really love the knitted cowls, we have really cold winters, so they would be perfect. These are so great! I love the HAND STAMPED DOG TAG WITH NECKLACE SET FROM BUY ME A PRESENT.